A stroke is what occurs when blood flow to the brain is blocked or stopped. Within a few minutes of a stroke, brain cells begin to die. According to the American Heart Association, stroke is the third leading cause of death in the US and can lead to long-term disability. Problems that can arise include weakness in an arm or leg after a small stroke to paralysis and loss of speech in larger strokes. This is why it's so important for someone who is having a stroke to get medical attention as quickly as possible. Stroke affects about one person every four minutes in the US, according to the US Centers for Disease Control and Prevention. If you or someone you're with has any of these symptoms, call 9-1-1 or get yourself or them to a hospital immediately. Staff in the emergency department will administer acute stroke medications to try to stop a stroke while it is happening. 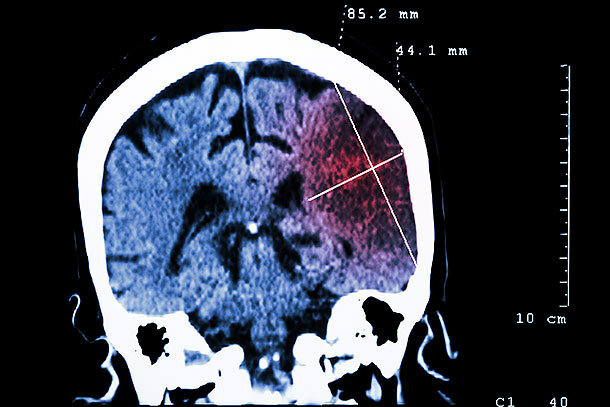 Ischemic stroke, the most common type of stroke, is treated with the 'clot-busting' drug known as tPA. The drug must be given to patients within three- to four-and-a-half hours after the onset of stroke symptoms, and preferably sooner. Smile. Does one side of the face droop? Can you see the same number of teeth on each side of the face? Hold up both arms for 10 seconds. Does one drift downward? Repeat a simple sentence. Is the speech slurred or strange? Can you understand the person? If these signs are present, every second counts. Call 9-1-1 immediately. For a non-emergency referral to a physician at Centennial Hills Hospital Medical Center, who can help assess your risk for stroke, contact our free physician referral service at 702-388-4888.